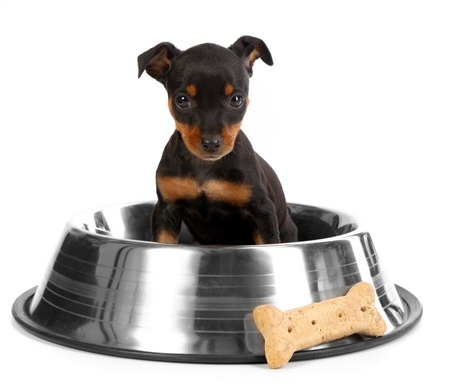 Are You Feeding the Best Puppy Foods? Deciding on the best puppy foods for your new addition can be a formidable job especially now that we literally have hundreds of thousands of foods from which to choose. Back in the day, one could go to their neighborhood supermarket, pick up a brightly colored bag of dog food, and then continue to feed that same food for the duration of the dog’s life. Luckily, we know a little more about nutrition now, so just any old bag of food is not likely to be acceptable to those who want only the best for their puppy. So do people choose the best puppy food? Well, some will accept the recommendations of friends, others will see a well know celebrity endorsing a food, and even a veterinarian or breeder might suggest the food that should be used for your puppy. What is wrong with these people? For starters, many of them are being paid to endorse the product. Celebrities do not make commercials for free. The veterinarian might sell the food and make a profit if you choose her brand. Dog food companies push their products by providing free samples for breeders to distribute to new owners or provide discounts when food is purchased in bulk. The breeder may not be knowledgeable about canine nutrition and feel she is getting a great deal from the dog food company. The best and only way (in my opinion) to decide which food to feed is to learn, analyze, and choose yourself. They say, knowledge is power, and in this case the old saying rings true. Puppies grow fast in their first 6 months of life and need extra nutrition to support this rapid growth. While large breeds grow much faster than small breeds, little dogs tend to reach maturity much sooner than their large cousins. Small breeds reach maturity somewhere between 8 and 12 months of age. Both undernutrition and overnutrition can be a problem in puppies. First, let us look at the nutritional needs of puppies. We know that the nutrition we provide our puppies will have a direct influence on his health and longevity. Not only does poor nutrition lead to health problems, but also lowers cognitive functions as well. And, we all want our puppy to be the smartest on the block, Right? We can thank the Association of American Feed Control Officials (AAFCO) for establishing minimum standards for the pet food industry. For any food to be labeled “complete and balanced,” it must have met a specific nutrient profile or pass a feeding trial. Protein is necessary for the puppy to grow and develop, heal from injury, maintain their coat and nails. Proteins are made up of either nonessential or essential amino acids. Dogs make their own nonessential amino acids but must obtain the essential amino acids from the food they eat. Digestible proteins can complicate the food story. Dogs are able to digest protein that is found in an animal’s muscle meat, but cannot digest other parts of the animal such as hair, beaks, or horns. Sadly, some poor quality foods are made primarily with these non-digestible by-products. Dogs can also obtain protein from non animal/fish sources. One common source of protein used in cheaper foods is Corn. When a manufacturer adds corn as one of the first few ingredients, it boosts the quantity of protein, making the food look more healthy than it is. Carbohydrates are another source of energy and provide the cells of the body with the necessary glucose. There are two types of carbohydrates: Simple (starches and sugars) and Complex (whole grains, fruits, and vegetables) that require more time to digest. This last group of complex carbohydrates provides the fiber the dog’s body needs for healthy digestion. Dog food that contains grains, vegetables and fruits are supply carbohydrates in the diet. Some sources of carbohydrates are better than others. There is a long standing argument about the amount of carbohydrates in dog good.Some say their shouldn't be any at all and others state that at least a small portion is necessary. A bit of fiber is necessary for optimal digestion, but since dogs are carnivores, they need a much larger portion of their diet to include protein from meat and fish. Fats provide the dog’s primary energy source, while keeping the coat healthy, his skin flexible and paw pads resilient. Fats are made up of fatty acids, which the dog’s body can synthesize, with two exceptions: Omega-6 and Omega-3, which must be provided as part of the diet. Diets that contain these fatty acids in the correct portions are much healthier than those that do not. Minerals are required in small amounts but are necessary to regulate growth and other body functions. Some of the most important ones are Calcium, magnesium, phosphorous, and sulfur. These substances must be in the correct amount to maintain health. More than 18 minerals are believed to be essential for mammals meaning that they must be consumed. Too much or too little will be detrimental. Since minerals can be destroyed by heat, air or acid, most dog foods need to add them back into the food after the food is made. Boron found in broccoli, pears, honey, chick peas, carrots, beans, bananas, apples, beans and lentils. Calcium can be obtained through eating fish, bones, dairy, egg shells, spinach, beans and broccoli. Copper comes from Kale, spinach, beet greens, asparagus, swiss chard, pumpkin seeds, flax seeds, chickpeas, and kidney beans. Iron is obtained by eating rabbit, chicken, turkey, pork, lamb, goat, ostrich, buffalo, egg, beef, salmon, fish and many of the same vegetables that supply copper. Magnesium is found mainly in meat and fish sources such as rabbit, chicken, turkey, pork, goat, ostrich, buffalo, egg, beef, salmon, halibut, haddock and sardine. Manganese comes from all the sources that supply magnesium and also from spinach, pumpkin seeds, flax seed, sunflower seeds, kidney beans, and chickpeas. Potassium can be obtain in the same sources as those of Magnesium. Silicon is found in organ meats, green beans, bananas, spinach, asparagus, and cucumber. Sulfur can be found in most plants and grazing animals. Unfortunately, cooking, freezing and irradiation will destroy most of the natural forms of sulfur, so synthetic forms must be added back into the food. Sodium is abundant in shellfish, eggs, dairy, swiss chard, beet greens, collard greens, dandelion greens, spinach, garbanzo beans and mung beans. Zinc is important to prevent skin problems, shedding and poor reproductive performance. Most meat and fish sources contain zinc as well as pumpkin seeds, spinach and kidney beans. Each vitamin provides a vital role to keep the body healthy whether it is a human or a canine one. Vitamins are labeled with letters and numbers or their names are written out on the label. If neither of these is present, the foodstuff that provides the vitamin is listed in the ingredients. For example, if kelp is on the ingredients list, it will provide iodine. Retinol is vitamin A: A deficiency will result in vision loss, blindness, skin disease and growth retardation. Riboflavin is vitamin B2 deficiency results in loss of appetite, weight loss, eye problems and skin irritations. Niacinamide (Niacin) is vitamin B3. Insufficient intake of B3 results in Black Tongue disease, weight loss, bloody diarrhea, and vomiting. Pantothenic acid is vitamin B5 is required by the body to prevent fatigue, nausea and headache. Pyridoxine is vitamin B6 deficiencies result in anorexia and weigh loss in puppies, convulsions, muscle twitching, anemia, rashes, and a weak immune system. Cobalamin is vitamin B-12 deficiencies can result in diarrhea, weight loss, loss of appetite or eating too much, weakness, lack of muscle mass seizures and even death. Cholecalciferol is vitamin D in insufficient quantities causes lameness, poor bone development, rickets, loss of muscle mass, renal failure and heart disease. Water is needed by all living things to survive. Without adequate water intake, dogs can quickly become dehydrated. This can happen very quickly in small puppies. Dog Food brands use labels to describe the type of dog for which the food is intended such as large breed, small breed, seniors, etc. To assure that your puppy's nutritional needs are met, Look for a food that is labeled for Puppies, Growth and Lactation or For All Life Stages. The ideal food will be a completely balanced diet that will provide enough calories without adding too many extra leading to obesity. Not only will too many calories lead to obesity, it will also contribute to faster skeletal development. This in turn leads to skeletal abnormalities. This is more of a problem in large breed dogs, but can also occur in some small breed dogs as well such as the Cavalier King Charles Spaniel and Pug. When feeding puppies, you need to consider what is being ingested as well as how much the puppy is eating. A puppy’s food should contain the minimum quantity of nutrients such as protein, fats, and carbohydrates needed for health. Other ingredients such as minerals and vitamins must be present in the right quantities. For example, calcium should be part of the puppy’s diet, but too much or too little can cause skeletal problems later on in life. Other ingredients such as phosphorus, magnesium fat, water-soluble vitamins, and trace minerals must be present in the appropriate amounts to prevent problems as the dog grows. This is why so many veterinarians will not endorse homemade diets because they are just too difficult to get right. Getting everything right can seem almost impossible. But it is possible to provide a very high quality commercial diet for your puppy if you know how to evaluate your options. We could go with the recommendations of our friends or our puppy’s breeder. Better yet, let us arm you with the knowledge to make the decision all by yourself? This is where I can lead you through the process. To begin, you must first examine the label. Product formulated to meet the nutritional levels established by the AAFCO dog food nutrient profile for Growth (Or, all life stages). Never feed your puppy adult food. Puppies have different requirements, they need more of some nutrients, less of others. You will know that the food is intended for puppies by seeing the AAFCO Statement that contains For Growth or All Life Stages. Puppies should stay on puppy food for the first year unless your veterinarian believes that switching to a maintenance diet might be beneficial. Check with your veterinarian for more advice about the best puppy foods for your particular breed. Look at the first six ingredients: These are the most important ingredients when analyzing your best puppy food. These are the ingredients in the highest quantity. Ingredients are listed in order by quantity, so there is more of the first ingredient present than the last. If the item is listed more than once in different forms, the food is likely to be predominately that food. For example, if you saw corn meal, corn gluten and corn flour as the second, third and fourth ingredients even though the first was chicken, the food would contain more corn than chicken. Corn, by the way, is not highly digestible in dogs. Look at protein sources: Look for the named protein source (chicken, turkey, salmon); The protein source should always be the first ingredient. Cheaper foods will label protein sources as meat or meat by products. These are not as healthy as the named sources such as chicken, beef, or salmon. Avoid anything that does not name the particular meat such as meat meal, meat by-products, animal fat (The source of the ingredient is unknown and could come from sources you do not want to consider (road kill, euthanized pets). They can also change from one batch to another, meaning that you could be getting turkey one time and beef another. This is a major problem if the dog has allergies and you are trying to eliminate the problem food. Avoid foods whose first ingredient is a grain such as corn or wheat or even rice. These foods boost the protein in the food, tricking the buyer into thinking the food is healthier than it is. If you suspect allergies such as scratching, avoid corn, wheat, soy. Additionally, if your dog is showing signs of a food allergy, which often shows up as excessive scratching, consider a food with as few ingredients as possible. It is much easier to eliminate an item if the food contains only chicken and rice. Artificial preservatives are not advised. Here are three examples of popular puppy foods. One is very high quality, one is average, and one is below average. Can you tell the difference? If you were choosing the best puppy foods for your dog, which one would you choose? These are three popular brands of dog food, but if you are choosing the best puppy foods for your dog, I would recommend you choose Brand A. Next, we will look at the Guaranteed Analysis Statement for Puppies: On a dry matter basis, these are the minimum quantities to look for on dry kibble. Remember that the figures in a guaranteed analysis statement only list quantities, not the quality of the ingredients. If you are comparing canned food, you will need to convert the numbers to dry first. 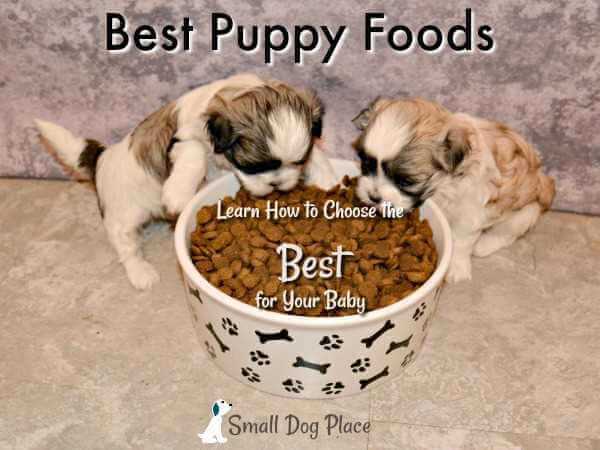 Once you have some idea what to look for in the best puppy foods, it will be time to shop. Click Here for more information on how to read dog food labels. Now that you know a bit about what is required in your new puppy's diet, how do you choose the best puppy food? Many people continue to feed the food recommended by the breeder which may or may not be a wise idea. If the breeder is feeding a premium brand that meats all the tests listed above, than continuing is fine. Most likely, many breeders find a average brand that is affordable especially if she has a large number of dogs to feed. In this case, you may want to evaluate your options.